TB is a serious and increasing problem in the developing countries like Pakistan, to be a major cause of morbidity and mortality in our country. Factors responsible for TB in Pakistan are late diagnosis, inadequate follow-up. This in turn leads to treatment failure, relapse, and emergence of multidrug resistance (MDR) TB. As per WHO estimates, about 410,000 new cases of TB develop in Pakistan every year with prevalence of 373 cases per 100,000 population and incidence of 231 per 100,000 populations and the majority of the cases are in productive age group. Although high case detection rates have been achieved in the country by National Tuberculosis Control Programme (NTCP); the delay in diagnosis and unsupervised, inappropriate, and inadequate medicine regimens are some of the reasons for not reaching the target cure rates and emergence of medicine resistant forms of TB. Currently, Pakistan has an annual death rate of 38 per 100,000 people attributed to TB. Pakistan adopted directly observed treatment, short-course (DOTS) strategy in 1995. Public awareness programs for early detection and effective treatment of TB plays important role in control of disease in any country. Health seeking behavior and non-adherence to therapy has been cited as major barrier to the control of TB. Non-adherence is a complex, dynamic phenomenon with a wide range of interacting factors impacting treatment taking behavior. It poses a significant threat to both the individual patient and public health and is associated with higher transmission rates, morbidity, and costs of TB control programs. Furthermore, it leads to persistence and resurgence of TB and is regarded as a major cause of relapse and drug resistance. , Keeping in view the present situation in Pakistan, a study was designed with the general objectives; wherein we investigated the knowledge, perceptions of (access to) TB treatment, and adherence to treatment among Karachi city population. Descriptive cross-sectional study was done. Community of Karachi having population of 20 million was selected to assess awareness of TB and patients of public sector hospitals in Karachi were selected. A total sample size of 175 participants was taken, out of which 75 were community members while 100 were patients on DOTS treatment. Non-probability convenient sampling was done. Community members of both the sexes above 18 years of age and patients of both the sexes were included in the study. Those community residents and patients who have received health education program were excluded. After selection of subjects from community and patients from DOTS center, their verbal consent was taken. They were asked questions and questionnaire were filled which had been translated into local language. Questions related to knowledge on TB types were included. The first question involves knowledge on TB in general; "TB can easily be cured if you take the right treatment". The second, "If you have TB it takes many months to be cured" assessed knowledge on TB. The third question "what source of knowledge about TB". 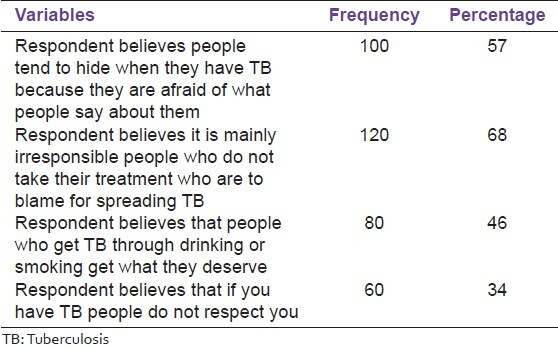 During the interview it was made clear to respondents which question addressed TB. In total, eight agree/disagree questions were presented to the respondent (correct = score 1, incorrect = score 0). The total score therefore ranges from 0 to 8, with higher scores indicative of greater knowledge. The results also revealed specific perceptions and attitudes toward TB within this community. People think that irresponsible individuals who do not take their treatment are mainly to blame for spreading TB. Besides blaming those individuals, they accuse them of hiding their TB status for fear of what others might say. They also think that people who acquire TB through drinking and smoking are getting what they deserve and that TB patients are less respected within the community. This suggests that people might be subjected to a high level of stigmatization. These items were included in the questionnaire to investigate the extent to which people in this community share these attitudes and perceptions. Statistical analyses of attitudes and perceptions toward TB, adherence to TB treatment, health seeking behavior, and TB treatment types consisted of frequency counts and percentages. Regression analysis and logistic regression analysis were performed to test whether differences in age, gender, and education level led to different knowledge scores and different attitudes and preferences toward TB, adherence to TB treatment, health seeking behavior, and TB treatment types. All statistical analyses were performed using Statistical Package for Social Sciences (SPSS) 16.0. The Dow University Ethical Review Committee has approved this research project. Every questionnaire attached with consent form. No sharing of information and data of study was the property of investigator. Result of study was communicated to health department. The complete process of data collection and analysis was approved by ethical committee of Dow University. Mean age of data set was 42 years (standard deviation (SD) 2.1) and age of the subjects ranged from 19 to 70 years. More than half (57%) of participants were male. Nearly half (46%) of the participants were illiterate. Nearly two-third (73%) were single on marital status. More than half (60%) were blue collar (manual labor) occupation [Table 1]. More than one quarter (35%) of participants heard about TB. Regarding source of knowledge, nearly half (40%) of the participants gained knowledge about TB from media. 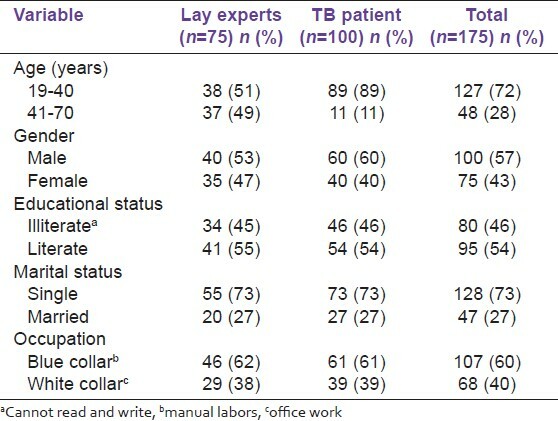 Most of respondents had correct response regarding TB symptoms, spread, prevention, and control of TB [Table 2]. Results show that 75% believe people with TB tend to hide their TB status because they are afraid of what others may say, 68% believe it is mainly the irresponsible patients who do not take their treatment that are to blame for spreading TB, 46% believe that people who get TB through drinking or smoking get what they deserve, and 34% believe that if you have TB people do not respect you [Table 3]. 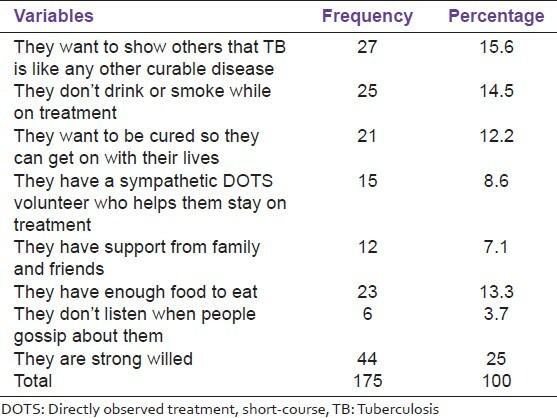 Fifteen percent believe "they stick to the rules of treatment", and it is the most important thing that helps TB patients stay on treatment for 6 months, followed by "they want to show others that TB is like any other curable disease" (14%) and "they don't drink or smoke while on treatment" (12%) [Table 4]. More than half (57%) of the participants were afraid of taking TB medicine, nearly half (45%) were taking medicine under supervision [Table 5]. In Pakistan, health education programs on awareness of TB have made good impact on people's knowledge about TB. In this study, we have found that most of the people (64%) don't know about transmission of TB and only 32% knew it was transmitted through contact with TB patient, but the knowledge regarding TB is associated with inappropriate health seeking behavior. Only 18.7% of participant knew that cough and fever are high risk for TB and transmitted to other people. The negative attitude on TB among general population after the health education program raised our concern on the health educations regarding TB in Pakistan: The question arises is that how this campaign is successful and what is the cost-effective way to reduce burden of TB? Though our study has pointed out various factors that can affect the knowledge and compliance to ATT, but results should be interpreted cautiously as there are certain limitations. These include; patients were recruited from selected hospital, which might not truly reflect the vision of the whole population in Pakistan. Another limitation is that information is dependent on self-reported data and the survey on healthcare seeking behavior was based on recall history. To minimize recall bias, questionnaires were pretested and all questions were set to be easily understood; data collector were carefully trained and supervised. We have tried to address this limitation by taking time from patient initially by asking them about their spare time for interview, so that the interview was conducted on the convenience of the participants and that helped us in exploring the perceptions and insight information regarding adherence to ATT. The results are suggestive of a high level of stigmatization; 57% of respondents believe people with TB tend to hide their TB status because they are afraid of what others may say. People think that irresponsible individuals who do not take their treatment are mainly to blame for spreading TB. Besides blaming those individuals, they accuse them of hiding their TB status for fear of what others might say. They also think that people who acquire TB through drinking and smoking are getting what they deserve and that TB patients are less respected within the community. While research shows that the increased TB incidence and prevalence during the last decade is mainly due to population increase where TB is most prevalent, increase of poverty  and most people within this community believe it is mainly the irresponsible patients who do not take their treatment that are to blame for spreading TB. Also the finding that respondents believe people who drink and smoke "get what they deserve" indicates blame and potential stigmatization. To increase awareness about TB, Government or the NTCP must highlight on dissemination of knowledge through electronic media in order to combat this highly infectious disease to get rid from the population. Importance of early diagnosis and early initiation of treatment are major component of health education to prevent transmission of TB. Work should be done to make people aware of risk of TB; so as to know that it is a curable disease with adequate treatment, but if not treated properly it may spread to other people and it results in disability and death of the individual. Poverty eradication programs should have component of health education for hygienic and healthy living. The results of this study show that while TB "lay experts" knowledge seems fairly good, their perceptions suggest that stigma may play a significant role in case finding and case holding. Findings from this study are important in improving the societal supports to TB patients. It would seem, therefore, that community education should focus on improving attitudes and perceptions, thus potentially reducing stigma. It requires a patient centered approach, which starts with interventions targeting the intrapersonal level (empowerment, self-help, advocacy, and support group) to empower TB patients. Most of the subjects were unaware of TB that seems to be due to their illiteracy and those who knew had got the knowledge from media, but the majority of the patients who were on DOTS were found to be satisfied. TB awareness among Pakistani population is low and need to be improved through combined efforts of government and health professionals. Burden of TB in Pakistan has not changed significantly because of low literacy rate and lack of awareness. Attitude towards TB treatment was negative as health professionals were giving health education to their patients. The author thanks Prof. Dr. Nighat Nisar for supporting to conduct the study. 1. Raviglione MC, O'Brien RJ. Tuberculoses. In: Braunwald E, Fauci AS, Kasper DL, Hauser SL, Longo DL, Jameson JL, et al., editors. Harrison's Principles of Internal Medicine. 16 th ed. New York: McGraw-Hill Professional; 2004. p. 953-66. 2. Global and regional incidence of Tuberculosis. World Health Organization, Information Recourse Centre HTM/STB. Tuberculosis facts sheet number: 104; 2006. 3. Directly observed treatment short-course: Tuberculosis cure for all. Indian Council of Medical research. ICMR Bulletin. 2001; Report no.:21813/71. 4. Frieden TR, Mullins J. Research for action: Understanding and controlling tuberculosis in India. New Delhi: World Health Organization: Regional Office for Southeast Asia, 2000; Report no.:31004. 5. Reaching the Poor: Challenges for TB Programmes in the Western Pacific Region. World Health Organization. ISBN 929061093, 2004. 6. Nhlema B, Kemp J, Steenburgen G, Theobald S, Tang S, Squire SB. A systematic analysis of TB and poverty. Global Stop TB partnership, World Health Organization. Geneva; 2003. Available from: http:// www.who.int/tb. [Last accessed on 2013 Oct]. 7. Guidelines for diagnosis and management of Tuberculosis, A national clinical Guidelines, Pakistan Chest Society, PCS Publication; 2011; no. 3. Available from: http://www.pcs.org. [Last accessed on 2013 Oct]. 8. Global Tuberculosis Control. WHO Report. World Health Organization (WHO). Available from: http://www.who.int/tb. [Last accessed on 2013 Oct]. 9. World Health Organization Global tuberculosis control: Surveillance, planning and financing. Geneva: WHO; 2005. Available from: http://www.who.int/tb. [Last accessed on 2013 Oct]. 10. Pakistan Tuberculosis Control Program in National and International Respective. World Health Organization (WHO); 1994. Available from: http://www.ntp.gov.pk. [Last accessed on 2013 Oct]. 11. Tang S, Squire SB. What lessons can be drawn from tuberculosis (TB) control in the 1990s? An analysis from a health system perspective. Health Policy 2005;72:93-104. 12. Agboatwalla M, Kazi GN, Shah SK, Tariq M. Gender perspectives on knowledge and practices regarding tuberculosis in urban and rural areas in Pakistan. East Mediterr Health J 2003;9:732-40. 13. Date J, Okita K. Gender and Literacy: Factors related to diagnostic delay and unsuccessful treatment of tuberculosis in the mountainous area of Yemen. Int J Tuberc Lung Dis 2005;9:680-5. 14. Zhang T, Liu X, Bromley H, Tang S. Perceptions of tuberculosis and health seeking behaviour in rural Inner Mongolia, China. Health Policy 2007;81:155-65. 15. Muture BN, Keraka MN, Kimuu PK, Kabiru EW, Ombeka VO, Oguya F. Factors associated with default from treatment among tuberculosis patients in Nairobi province, Kenya: A case control study. BMC Public Health 2011;11:696. 16. Comolet TM, Rakotomalala R, Rajaonarioa H. Factors determining compliance with tuberculosis treatment in urban environment, Tamatave, Madagascar. Int J Tuberc Lung Dis 1998;2:891-7. 17. Wasonga J. Factors contributing to tuberculosis treatment defaulting among slum dwellers in Nairobi, Kenya, International congress on medicine therapy in HIV. The Gardiner-Caldwell Group Ltd 2006;310:19. 18. Davies PD. The world-wide increase in tuberculosis: How demographic changes, HIV infection and increasing numbers in poverty are increasing tuberculosis. Ann Med 2003; 35 Suppl 4:235-43.